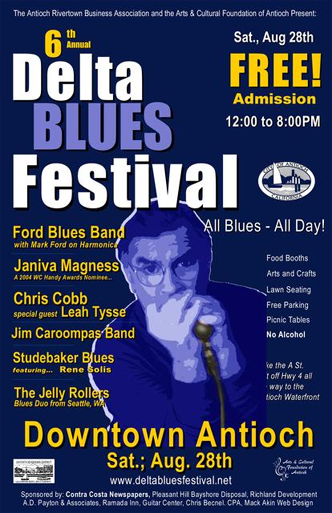 The Delta Blues Festival was created by David Williamson. The intention was to offer a non-acoholic festival with live music for families to have their children in attendance. David rallied together 3 local blues bands together and put on the very first Delta Blues Festival on October 23, 1999. David's band, "the Delta Dogs" headlined the show, while the Bluesville Bomers and the 24th Street Sheiks started the day. The event was presented by the Antioch Civic Arts. David and his team got the word out about the free festival and the event was a success! ActsThe event had positive rumors flying around town about its successful first year. The 2nd festival now had presenters and sponsors. 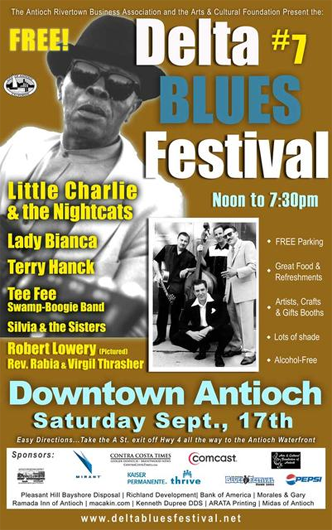 The City of Antioch, and the Antioch Rivertown Association present the festival to the city, supporting the free day of music and join forces to offer a wonderful day of free, live entertainment. The mention of "family-style" starts to appear in the flyers as bigger artists are booked for entertainment. With the festival still in October, it's noted that this free event will happen "rain or shine." It should be noted that Pleasant Hill Bayshore Disposal (now Republic waste) makes their first appearance as a sponsor. They are still with us today. No flyer can be found for this event. The festival was 4 days after the 9/11 catastrophe. David Williamson, presented the American flag, and offered patriotism by playing the national anthem and offering a moment of silence for our country. attendees with the world in shock of terrorism. The festival continued and went on without a hitch. People used the festival as a "release" from the on-going CNN, and local news broadcasts of terrorism that invaded the USA. The Festival is now on a roll. The first DBF, 11" x 17", poster is generated. The support of our sponsors are strong and the festival's attraction is growing in the community. 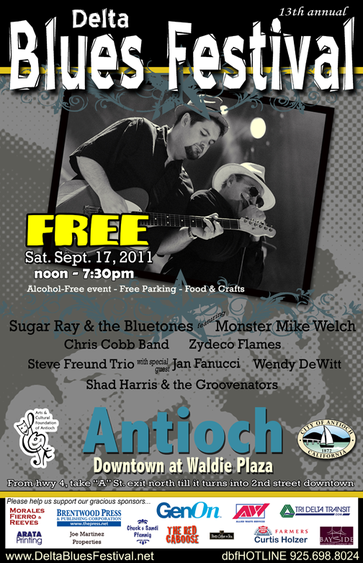 Four years of commitment and hard work have created a wonderful family event for the residents of Antioch. The event remains free, and we now see the statement of "No Alcohol." Bigger acts are obtained, with Junior Watson as the headliner, with more acts are involved in the lineup. Festival hours have now increased to 7 hours of entertainment. Johnny Nitro, a San Francisco blues legend (and Antioch resident), makes his first appearance. The suggestion of a "picnic-type" atmosphere is promoted on the larger black and white flyer. Also in addition are Craft and Gift vendors. The DBF has reached its 5th year and is growing strong. Our first color 11x17 poster hits the market! The lineup of entertainment is getting better and more creative. Choosing to use mostly Bay Area bands, as budget dictated. But this was no problem. Johnny Nitro delivered an amazing performance, showcasing an "all-star guitar shootout." A terrific way to celebrate the festival's 5th year milestone. An after-party was held to celebrate. Food, drink and entertainment were offered to all the sponsors and supporters of the event for the past 5 years. The 2003 festival was a great success, only to meet its lowest point. One month later, its creator would die in a car crash. David's family knew how important the festival was to him and to the community. They asked that Frank & Gail Giovanni and family take over the event in honor of David. 2004 was a tough year. David's files were loos in a box and a lot of the organization of the festival was in his "head" and not on paper. Trevor Donahgu, Peter & Judi Hagen, Rick Carraher, Diane Gibson-Gray, Randy, Sampson, Gail & Natalia Giovanni, Jay Smith, Kyle & Ryan Dieker, Ken & Rose Helms, Gina Lueck, Curtis Holzer, Alex Spaete, Kenneth & Dana Dupree, Tresa Clyde, June Lister, etc. 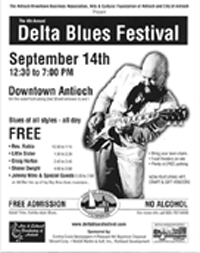 The poster was a tribute to the man who put the Delta Blues Festival on the map. We moved the festival to August, and that was the last time we would ever do that. It was very hot and the heat did not settle until 6pm. We also booked the Ford Blues Band, with Mark Ford (one of David's harmonica idols) as our headliner. The City of Antioch, Rick Carraher and the Rivertown Association, Greg Robinson and ThePress.net, Susan Hurl & Republic Waste, etc. It's time to step up our game. With one successful festival under our belt without our founder, it was time to try and step things up. National Acts. We hired the famous, Little Charlie and the Nightcats. We tell people that the stage is still rocking from this event. We were also very proud to have Mr. Robert Lowery, a famous acoustic Delta Blues artist open our event. New sponsors joined the team! Kaiser, Pepsi and Comcast. Getting more creative all the time, our full color advertisements noted that ALL AGES are welcomed. Still staying free to the public through our sponsors. New sponsors appear and some go away. The Antioch Rivertown Association dissolved and our new fiscal sponsor became the Arts & Cultural Foundation of Antioch. Diane Gibson-Gray, has been the silent force behind the scenes that made (make) everything possible. Our volunteers stay with us and new join the team. 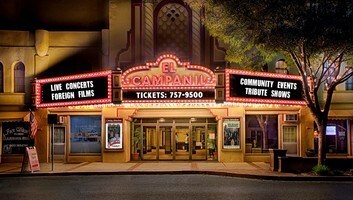 We now start offering event programs with artist profiles and advertising opportunities. Here we showcased women of the blues, hosted by Chris Cobb. For our headliner, we were able to capture Roy Gaines. 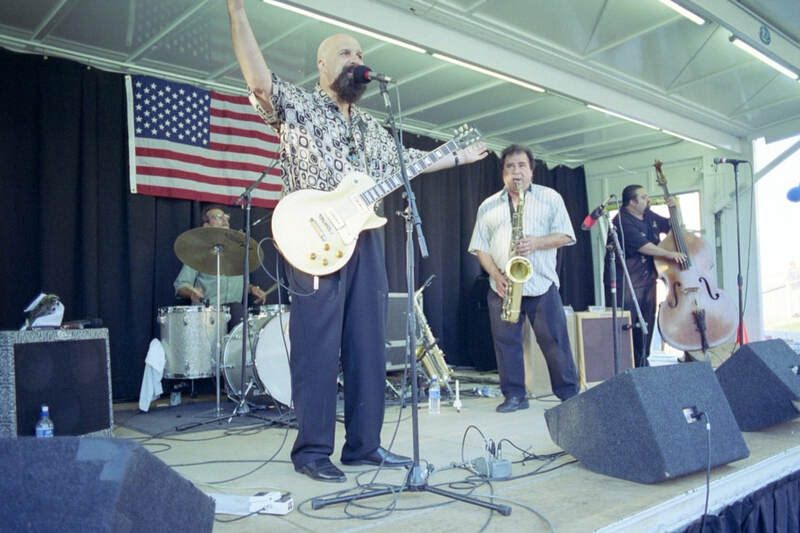 Mr. Gaines, is an iconic international blues legion. His appearance at the Delta Blues Festival truly gave credibility to our event - as we now became known as a festival that presents bigger-name talent. #9 is where we realized that Zydeco Music was a very important part of the blues, and the community. It was the producers favorite time of the event. It was where it was first noticed that people of all ages and cultures got along and danced. No politics, no age, gender, or race issues... just dancing. 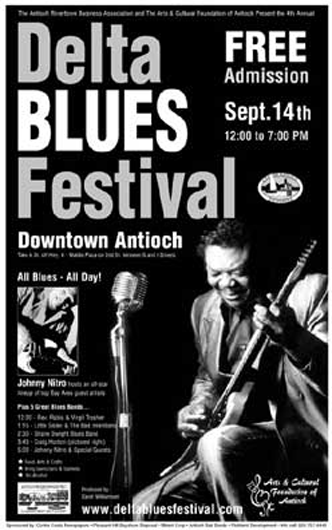 2007 was also the year where the Delta Blues Festival was nominated for Antioch's Citizen of the Year. We continued to present national acts and local talent, with also presenting our first young group of musicians, Blue Horizon. What an event! Our biggest lineup of national and international talent to date. The community showed up in great numbers and received an outstanding show. We've now established the festival as a true event destination. Lawn chairs get put out earlier to reserve a "good spot." 2013 was an interesting festival... it was the only festival that had rain. It was a torrential downpour from noon to 3pm... but our crowd stayed. DBF volunteers gave out hot coffee to keep people warm, and offered large garbage bags for people to create make-shift ponchos. When the rain cleared, the Zydeco Flames tore it up! and the festival went on! This is the only festival with a repeat of talent from the year before. Gregg Wright's performance was so powerful, that it warranted a headline spot the following year.